The 2013 model year is almost gone but the Chrysler Group has introduced the new Ram 1500 Black Express to help the half ton pickup finish the model year strong – with this all black package applied to the popular Express value group offering Hemi power and a sinister, sporty appearance. As the name may indicate, the 2013 Ram 1500 Black Express is based on the value minded Express package and this all-Black appearance package is available with either rear wheel drive or four wheel drive and with any of the three available cab options (Regular, Quad or Crew). Like the other 2013 Ram 1500 Express models, the Ram Black Express is powered by the 5.7L Hemi V8 with 395 horsepower and 410lb-ft of torque being channeled to the wheels via a 6-speed automatic transmission – a configuration that allows this murdered out half ton to tow 9,250 pounds when properly equipped. The 2013 Ram 1500 Black Express package focused on the exterior design with pretty much every inch of the truck finished in gloss black. In addition to the black exterior paint that covers the body, the Black Express package adds black 20 inch wheels, a black front fascia with black grilles, black headlight bezels for the standard HID projection headlights, a black upper grille surround with black honeycomb inserts and a black Ram head logo, a black rear bumper, black taillights with red LED lighting, black tailgate badging and a black Ram’s head on the tailgate. The only items around the exterior that are not black are the chrome lugnuts and the chrome dual exhaust tips that poke through the bottom of the rear bumper. The result is a Ram 1500 that the Chrysler Group insists is the “baddest looking” truck on the market and based on these pictures – I am inclined to agree. The Ram Express package helped to bring the Hemi V8 engine to more half ton Ram truck buyers with a low price thanks to the exclusion of high priced standard features that drive up the price of the higher end trimline trucks. 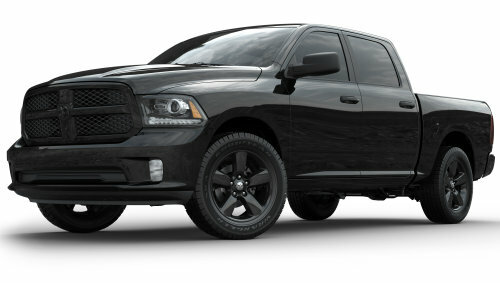 Prior to the Express package, a new Ram 1500 buyer who wanted a Hemi would have to opt for one of the more expensive trimlines that added features that the buyer may not want but the Express – and the Black Express – give buyers the option to get the Hemi Ram that they want without the price adding features that they do not want. 2013 Ram 1500 Black Express pricing starts at $26,955 including a destination charge of $1,095 for the rear wheel drive, regular cab configuration and based on that price; the Black Express package adds just $1,495 to the price of the basic 1500 Express. With the 2013 model year winding to a close, the Black Express should help entice sport minded buyers to opt for this package that is great looking and surprisingly affordable for what you are getting. We can expect these trucks to start showing up in dealerships around the country by the end of this month.